Vera Bradley is known for their amazing collection of well made backpacks and colorful prints. The brand’s signature look has recently grown in popularity as other brands explore similar designs. Here we will explore bags like Vera Bradley that offer quilted textures, unique patterns and functional designs for everyday use at school, work and travel. LeSportsac offers a roomy backpack with tons of pattern choices with their Essential Voyager backpack. These bags feature a roomy main compartment that is secured with a drawstring and clasp. Outside you’ll find plenty of additional storage with two side pockets and a convenient zip front pocket. With an endless of choice of patterns, these Vera Bradley like backpacks are perfect for school, travel or a day out on the town! For anyone looking for brands like Vera Bradley, Stephanie Dawn bags are definitely worth a closer look. Stephanie Dawn offers a wide range of quilted accessories like handbags, wallets and eyeglass cases that are all proudly made in the USA. The Stephanie Dawn quilted backpack is beautifully crafted and features plenty of storage room in the main compartment for everyday items as well side pockets and a front zip pocket for extra storage. Although these bags are not quilted, they are a strong competitor with Vera Bradley’s Campus Tech Backpack thanks to it’s dedicated laptop compartment, useful pocket organizers, and roomy 25L capacity. There is even an on-demand side water bottle compartment that stays hidden until you need it. What we like most about these backpacks are their comfort shoulder straps that keep the backpack secure and comfortable with even the heaviest loads. Sol and Selene is a brand that specializes in quality bags that make a statement. The Sol and Selene Motivator features a quilted backpack design like Vera Bradley but focus more on simplicity with it’s solid color choices. The Motivator features a padded laptop compartment, plenty of pockets for smaller items and even includes a removable drawstring nylon laundry bag for gym or travel days. What we like the most about this backpack is that’s it’s made of water repellent nylon which makes it the perfect backpack for those on the move. When we think of awesome brands like Vera Bradley, we often think of Sakroots. The brand offers plenty of cute bag designs in dozens of unique patterns. We love the Flap backpack for it’s thoughtful features. The bag uses a flap and drawstring closure to gain access to the main compartment but also utilizes a side zipper pocket to access the main compartment. A hidden zip pocket in the back of the bag fits a tablet or laptop up to 13 inches. All these cool features makes the Sakroots Flap backpack as practical as it stylish. For those looking for quilted backpacks like Vera Bradley but with a designer twist, the Marc Jacobs Quilted backpack is the perfect choice. This backpack is made with a textile exterior and interior lining. Luxury accents such as leather zipper pulls and top handle give it an upscale feel. These backpacks can also be found in a variety of fun patterns so you will have no problem finding one that is uniquely you! Kipling is a popular brand that offers unique backpack designs. 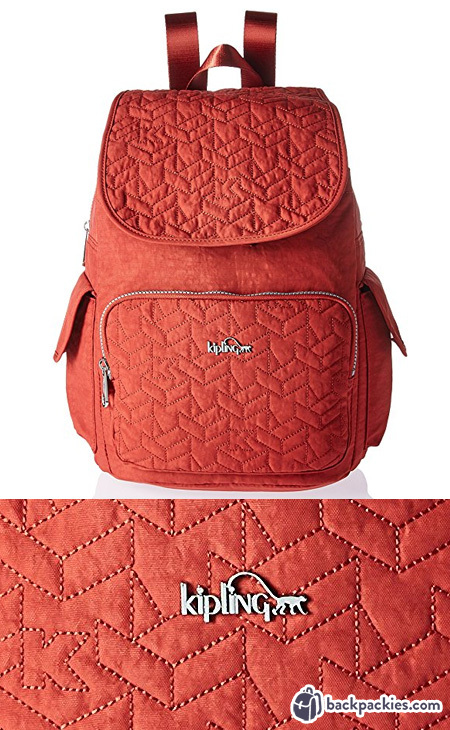 Their Ravier backpack offers plenty of storage room and all the handy features you would want in a cute quilted design. The roomy main compartment is secured with an magnetic flap closure while the side and front pockets offer plenty of extra storage room. The quilted design on the flap and front pocket are uniquely Kipling and feature a fun “K” design throughout. Betsey Johnson offers something different and unique with their quilted drawstring backpack. This bag is made of a rose quilted fabric and features a gorgeous flower patch detail. Inside you’ll find a roomy main compartment with a flower printed lining. Each backpack even comes with a matching pencil case for small accessories. The Betsey Johnson Drawstring backpack is available in multiple color and pattern choices that are bound to make a statement. Anyone looking for cloth backpacks like Vera Bradley that are unique and fun will find Betsey Johnson to be a charming alternative. Jansport offers a great mix of everyday functionality and exclusive print patterns with their Digital Student Laptop backpack. This backpack is perfect for those who love Vera Bradley’s use of unique patterns and tech storage features but need something more affordable. The Digital Student Laptop backpack features a removable 15 inch laptop sleeve, a 34 liter main compartment and plenty of extra pockets and organizers for your daily essentials. Older PostHerschel Retreat vs Little America - What's the Difference?